Edward Muybrige was a famous photographer in the mid 1800's. In 1877 a man named Stanford, who was very interested in horse racing asked him to provide evidence that all four of a horses hooves left the ground while running. Muybrige set up 24 camera's around an arena and proceeded to attach them to thread. From this experiment, he practically invented animation. This also lead to him doing a series of pieces on human motion and animal locomotion. The basic idea was to snap pictures of the animal in motion, and white out the background. When the images were flipped quickly, they gave the appearance of the animal, or person moving. It works much like a flip book. I find it very interesting that photo's such as these were among the first types of cinema. It was only a few years after Muybrige's photo's that actual short movies began coming out. Among the first of those was the 1903 movie, The Great Train Robbery. 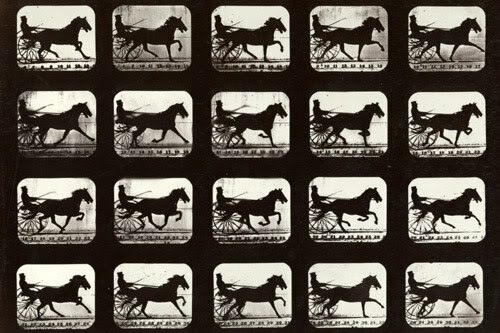 Leland Stanford (Stanford University, governor of California) Muybridge is late 19th cent.